Gluten Free Chicken Tenders are crispy, crunchy, and delicious! They are made with a delicious gluten free cheddar cheese cracker crumb, mixed with grated parmesan and then baked to perfection in a hot oven, your whole family will love them! 1. They are convenient, and it’s quicker to prepare the recipe, 2. They are cut into even sized pieces so they all cook at the same rate. If you are cutting your own tenders from chicken breast pieces this is the main thing to be aware of. If you have some small and some large pieces, the smaller pieces will be overcooked by the time the larger ones are done. Now add the Lance Gluten Free Cheddar Crackers to a small bag, close the bag, and crush them gently with a rolling pin into small pieces. If you smash them too hard you risk bursting the bag, so be gentle. Set up one bowl with the beaten egg mixture, another with the cracker crumb and parmesan, and lastly the sheet pan with a wire rack in it. Use one hand to dip the chicken in the egg then drop the chicken into the cracker crumb mixture. Using your other dry hand, press the cracker crumbs firmly onto both sides of the chicken tender. You can use tongs if you prefer and use a spoon or something similar to press the crumbs into the chicken. I have made these several times, both with and without baking them on a wire rack. You can bake them directly on a parchment lined baking sheet if you don’t have a rack, but just know that the cracker crumb on base of the chicken may be a little softer cooked this way. They are best served hot from the oven, the cracker crumb will soften over time if you leave them to sit for too long. I have reheated them for my kids and they were still raving about how good they were, but I don’t think they were quite as crispy after reheating. 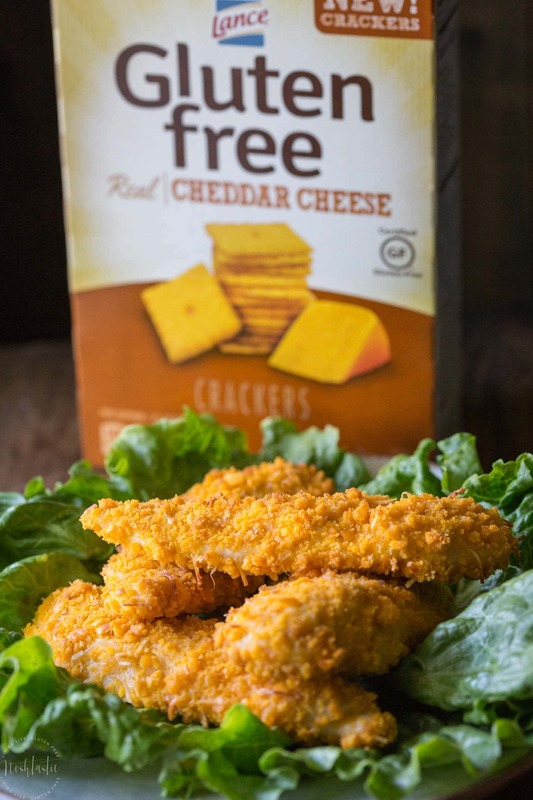 These yummy gluten free cheese crackers are still pretty new to the market but they are available already in some Publix, Wegmans, Meijer, and Harris Teeter grocery stores. I’ve also found the sandwich crackers in my local Target and Walmart, and Amazon carries many of their gluten free cheese crackers too! 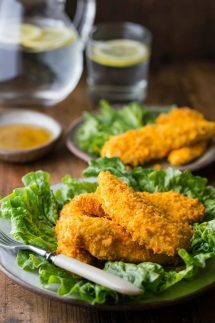 Gluten Free Chicken Tenders! They are made with a delicious gluten free cheddar cheese cracker crumb, mixed with grated parmesan and then baked to perfection in a hot oven, your whole family will love them! Preheat your oven to 375F or 190C. Line a sheet pan with parchment paper and add a wire rack to it, this will stop the chicken tender cracker crumb from getting soft on the bottom. 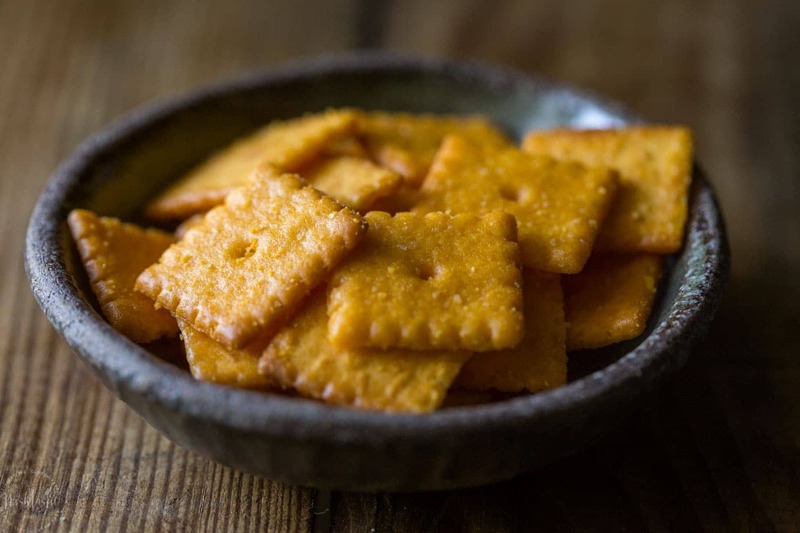 Add the Lance Gluten Free Cheddar Crackers to a small bag, close it, and crush them gently with a rolling pin into small pieces. You don't want to turn them into dust so go easy! Beat the eggs in a large wide bowl with the garlic powder. Mix the gluten free cheese cracker crumbs with 1/4 cup parmesan cheese and place them onto a wide plate or bowl. 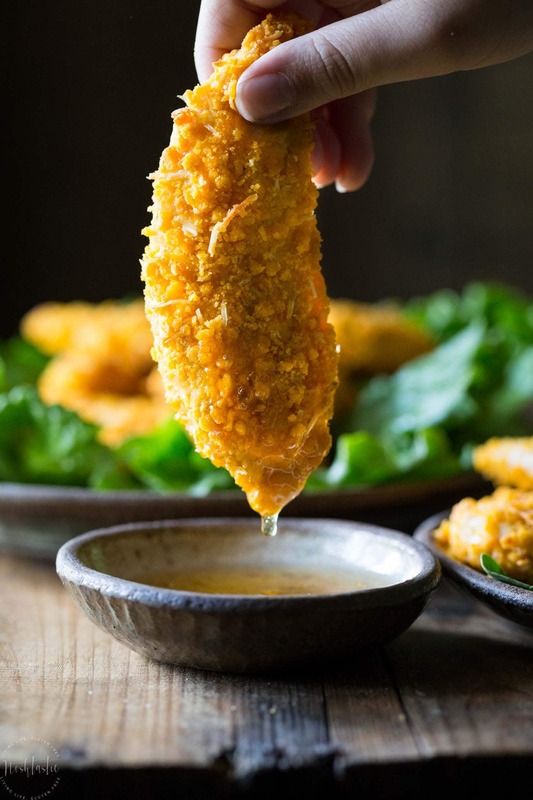 Use one hand to dip a chicken tender in the egg mixture then place it gently into the cracker crumbs. Now use your other hand (which should be dry) to press cracker crumbs firmly onto the surface of the chicken. If you put your wet hand into the cracker crumbs you'll just make them stick to your hand instead of the chicken. 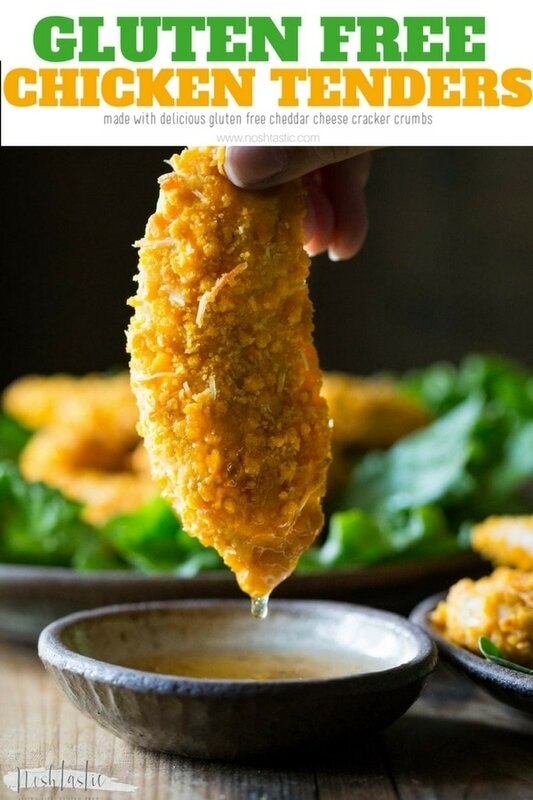 You can also use tongs, but you need to use a spoon or something similar to firmly press the crumbs onto the chicken pieces. Place the coated chicken tenders onto the wire rack on top of the sheet pan.